I've tried two new food items recently that are worth mentioning. The first is fruit2day. Fruit2day is a drink (6.75 fluid ounces) with two servings of fruit in a tiny package, no sugar added, and 110-120 calories. It's filling and has delicious bits of fruit throughout. It comes in the following flavor combinations: strawberry orange, pineapple banana, mango peach, cherry grape, and blueberry pomegranate. You get two per package, and I'll warn you that it's a bit pricey. However, there has been a coupon inside each package I've gotten, and they are on sale quite frequently. I've found them at Kroger and Super Target so far, and it's housed in the produce section. I really like it because it's portable - I can throw it in my purse and take it to work with me without worrying about having fruit in my purse. My husband and kids like them too, which says a lot! There are two Weight Watcher points per serving. The second product is actually a line of products made by gardein. The company makes several types of food products, including fresh, frozen, trio complete meals and offer a food service division which provides foods to be served in schools, restaurants, hospitals, and things of that nature. What is gardein? Meatless protein foods. (Think soy protein that doesn't taste like cardboard.) I got the trio complete meals, which is exactly what it sounds like - three things in one. I've tried the Burgandy Trio for lunch the other day, which has "beefless tips", veggies, and rice. It cooks in three minutes in the microwave, which sold me. The consistency of the "tips" was beef-like - not as chewy as beef, but definitely the best meatless-but-feels-like-meat product I've tried. The sauce was great, and the veggies and rice were as well. The veggies weren't chewy, which I appreciated. The Weight Watchers points value for this particular item was 4, and it was certainly filling enough for a meal without adding anything else. What appealed to me the most about this product is that I can take it to work for lunch. I bring my lunch almost every day, and I get sick of the same Lean Cuisines, sandwich, blah, blah. 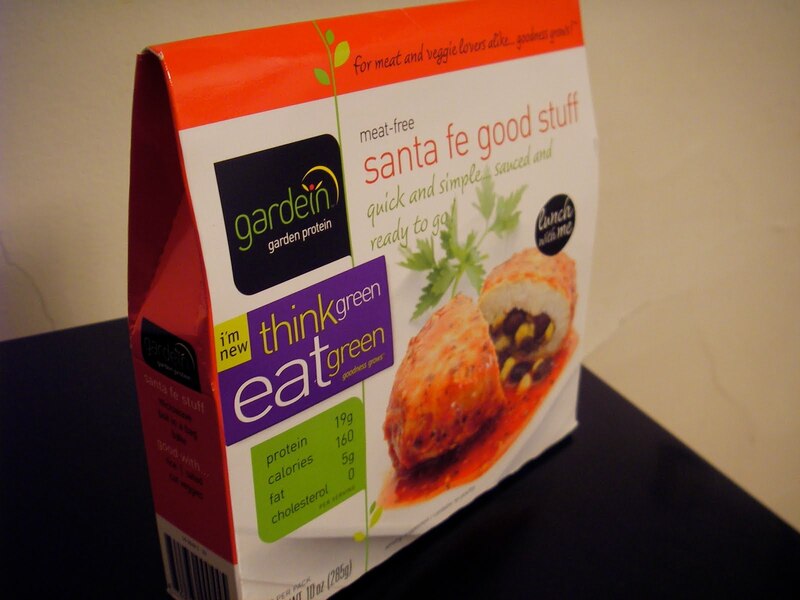 The gardein products can be found, according to their website, at Kroger, Safeway, and Whole Foods. They're in the (at Kroger) organic area in a refrigerated case. Much like the fruit2day, a little bit pricey when comparing to something like a Lean Cuisine. I think the gardein products I got were about $3.75 each, and they were on sale. However, if I were to eat my lunch out everyday at work I would be spending significantly more than that. Also, the gardein product is much lower in sodium, and is fresh, not frozen. I'm going to have the Thai Trio for lunch today!